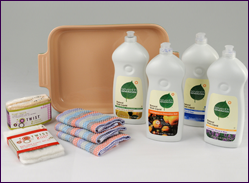 Seventh Generation dish liquid contains only essential oils and botanical extracts, and delivers real cleaning power. Your tableware will be left fresh and ready to serve your next home cooked meal. With authentic ingredients like lavender from the fields of Drome in the foothills of the Alps, clementines from sunny Calabria and lemons from the soils of Sicily, Seventh Generation natural dish liquid is free of unnecessary synthetic colors or chemically engineered scents. Enter the "Nature Makes Perfect Scents" sweepstakes at seventhgeneration.com/scents and you can have the chance to take a trip for two to visit one of the sourcing sites of Seventh Generation natural dish liquid fragrance ingredients. Visit seventhgeneration.com/scents to learn more about each scent´s origin. I am liking you on facebook too.